All respirators that rely on a tight-fitting mask-to-face seal need to be annually checked with either qualitative or quantitative methods to determine whether the mask provides an acceptable fit to a wearer. The QUALITATIVE fit test procedures rely on a subjective sensation (taste, irritation, smell) of the respirator wearer to a particular test agent. Also called the odor test or irritant test. If the odor or irritation is noticed, the unit must be refitted or another one used. The test is only as accurate as the user's sense of smell or sensitivity to irritation. The QUANTITATIVE fit test procedure utilizes the 5-step CNP REDON Respirator Fit Test Protocol with the OHD Fit Tester 3000. This testing measures face seal leaking. Necessary before entering a highly toxic atmosphere. The respirator is connected to instruments that measure how much of the test agent gets into the facepiece. You get an actual numbered measurement. We offer both qualitative and quantitative fit testing at either our facility or yours. The relative workplace exposure level determines what constitutes an acceptable fit and seal leakage. For negative pressure air purifying respirators, users may rely on either a qualitative or quantitative fit test procedure for exposure levels less than 10 times the occupational exposure limit. Exposure levels greater than 10 times the occupational exposure limit must utilize a quantitative fit test procedure for these respirators. Fit testing of tight-fitting atmosphere-supplying respirators and tight-fitting powered air-purifying respirators shall be accomplished by performing quantitative or qualitative fit testing in the negative pressure mode. NOTE: You must provide the mask you will actually be using on the job. The fit test is designed to check to see that the mask you wear is functioning properly. Not using the correct mask could result in an improperly fitting mask. STS does not perform the necessary medical evaluation. However, per OSHA 1910.134, this must be done prior to your actual fit testing to determine if you can safely wear a mask. Be medically cleared to wear a respirator prior to any fit testing as outlined in OSHA standards 1910.134(e), 1910.134(e)(1), and 1910.134(e)(2). Company must inform Safety Training Services, Inc. of make and model of mask being used for fit testing prior to instructor arriving on site. 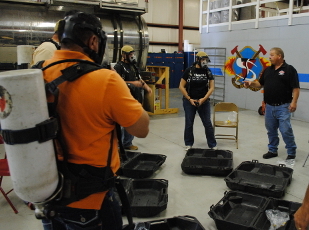 It is highly recommended that each employee have their own assigned mask and bring it with them the day of testing. If this is not possible, masks in sizes small, medium, and large must be be made available. Employees must be clean shaven. Per OSHA standards 1910.134(g)(1)(i), 1910.134(g)(1)(i)(A), and 1910.134(g)(1)(i)(B), facial hair must not make contact with the seal of the mask. Please click here for examples (link borrowed from EPCOR). Also, please be advised that Safety Training Services, Inc. does NOT provide razors and shaving cream for employees to shave the day of training. To help facilitate testing (especially if multiple employees are being tested), employees are asked to arrive promptly at their scheduled time. Note regarding masks: If company is unable to provide masks for fit testing, please inform us and we will do what we can to provide them for you. Be advised, however, that this may not always be possible as we do not stock every make/model of mask. Do You Need Respirator Protection Training?